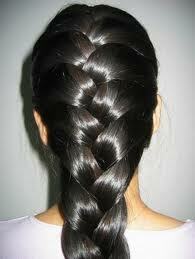 Every morning, before school, I had to french plait my daughter’s hair. over thumb and pinkie, gather and cross one over two, rest, three over one. three. Rest. Untangle. Cross and gather and turn. Return. Even furrows in mahogany hair. Line matching line. Gather, shape, three over one over two. Eventually I made her have it cut!! I have never had to do this with two sons (thank goodness) and my own hair was always too short as a child but I was with you all the way. Loved the ‘even furrows in mahogany’. It’s interesting how a daily task can be turned into poetry. it was a very trying time believe me! I was so relieved when we had it cut – my own hair has always been short so mastering the french plait came late in life!